Based off of the hit movie, Sega released a game, which lives up to every aspect of the film. In this game, you get to play as either Grant, a doctor of paleontology, or Raptor, an angry dinosaur. Grant's story is like this: You are stranded on Isla Nublar with dinosaurs roaming the land. You need to find a way off of the island, fighting your way through the treacherous dinosaurs all the while. Name of the game? Survival. Be sure to look out for the T-Rex, too! Raptor's story is quite different, as you could probably tell. Raptor has broken out of his cage and is now free to roam the Isle. He has picked up the scent of Dr. Grant and is now on the hunt to kill him. 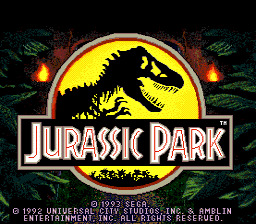 Jurassic Park for the Sega Genesis may be the greatest movie-inspired game for this platform, or any platform. They really captured the darkness of the movie in the game graphics, making it eye candy to some. The sound is superb; unique music tracks for each level, as well as decent sounding grunts and weapon impact noises. The game-play takes a little time to learn, but it's not as hard as you may think. A high recommendation to all, whether you're a fan of the movie or not! Playing as Raptor may seem easier than playing as Grant, depending on your preference. You don't need to worry about running out of weapons, because Raptor only uses his feet and his jaws of steel, so to speak. He has an amazing jump height and distance as well. His levels are also shorter, which may be a let down to some. Just like Grant, however, there may be times where you'll be desperate for aid. That's where the pieces of meat come in. Use those to fuel Raptor!